Qutub Minar is an exquisite example of the Mughal architecture. 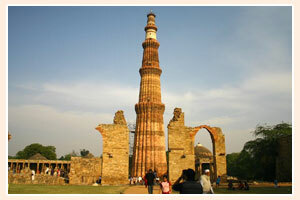 Qutub Minar is the highest stone tower in India as well as one of the finest Islamic structures ever raised. Qutub-ud-din Aibak laid the foundation for Qutub Minar in 1199 AD and his successor and son-in-law Shamsu'd-Din- Illtumish completed the structure by adding three more stories. This towering structure in red sandstone has a diameter of 14.32m at the base and about 2.75m on the top with a height of 72.5m. It has 379 steps leading to its top story. The first three storeys are made of red sandstone and the fourth and fifth floors are made of marble and sandstone. All the storeys are surrounded by a projected balcony encircling the Minar. There are also numerous Arabic inscriptions on the tower telling the history of Qutub.